Item1 - Photo of Ed Dyck as a young boy. Item5 - Photo of Heinrich and Sara Enns on horseback. Item6 - Photo of a 4-year old Gerhard Neufeld Jr. This photo is of the funeral of four men and one woman who were killed by bandits. The woman died with the men because she threw herself in front of her father. Likely they were relatives of Olga Enns's family. 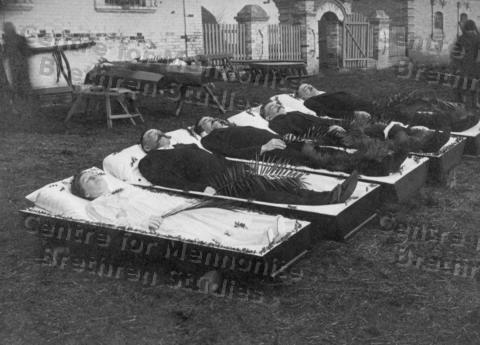 The photo of the five caskets appears in Paul Toews with Aileen Friesen, The Russian Mennonite Story (2018), 48. The same photo also appears in Gerhard Lorenz, Heritage Remembered (1974), 261. A description of the event appears in Helmut T. Huebert, "Five Murders in the Rosehof Region," Mennonite Estates in Imperial Russia (Springfield, 2005), 278-280.